Home health healthy sleep sleep video sleep worldhealthinfo Here is why you should sleep on your left side!! Here is why you should sleep on your left side!! Sleep is a necessary thing. Everybody knows that. Not only do you need it for basic survival, but your sleeping patterns also say a whole lot about your mental health. The mattress industry certainly knows this. There are as many types of mattresses on the market as there are sheep in a sleep-deprived, desperate mind. But let’s say you are looking to improve your sleep drastically without spending a ton on a new mattress. Better sleep is possible with simple alterations to your sleeping position. However, what’s the best position? One theory says sleeping on the left side is the way to go. The left side of the body is the dominant lymphatic side. Your lymphatic system aids in the removal of toxins and waste from your body. So you could say it is pretty crucial. By sleeping on your left side, you may find that your body becomes more efficient at removing waste and toxins from your body as well as relieving acid reflux, as Medical Daily reports. One of my coworkers found this to be true when she was pregnant. If she slept on her right side, she would get awful heartburn and would not be able to sleep. However, when she slept on her left side, no heartburn. This has to do with the position of the stomach. 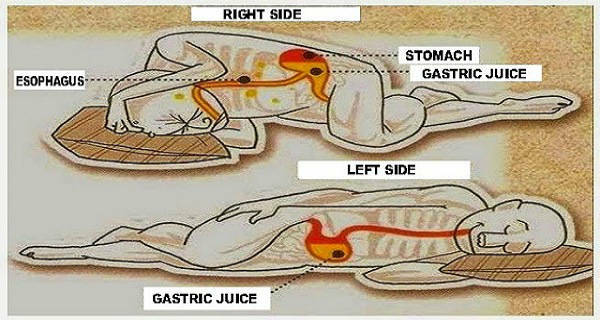 The stomach is on the left side of the body, so by sleeping on that side, gravity is helping the stomach juices stay in place. Less heartburn. Here is a short video about why sleeping on your left side is best!